Participation was light this time around...which means that if you didn't enter because you were afraid you wouldn't win...you should have listened when I said this was a great opportunity to take home the prize! We'll keep the contests rolling (the next one will start next Monday), so get yourself ready to enter next time. Michael Hawkins, for his post, How many of these do internet marketers apply? If you don't already have one, create a free account at Gecko Tribe Customer Privileges. Contact me through my help desk to let me know the email address you used to create the account. I'll then add SEO Content Factory to your download page, and give you the HTML code for putting the winner's badge on your blog post. 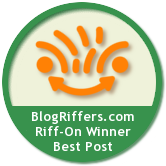 While reading through some of the entries for the contest, there were a few things that jumped out at me that I thought would be good to share to help everyone improve their Blog Riffs. I considered posting them in the blog, but I was afraid they'd be read by a few people and then disappear into the archives, never to be seen again. So instead, I created a short email course called "High-Impact Blog Riffing". Use the form above or below this post, or on just about any page on BlogRiffers.com, to subscribe to the course. If you sign up quick, you'll have received my first two big tips by the time the next contest rolls around, increasing your odds of winning the next prize. ...which, by the way, won't be SEO Content Factory. I'm thinking the next one will be related to affiliate marketing. Stay tuned (and subscribe to the mailing list) for details.